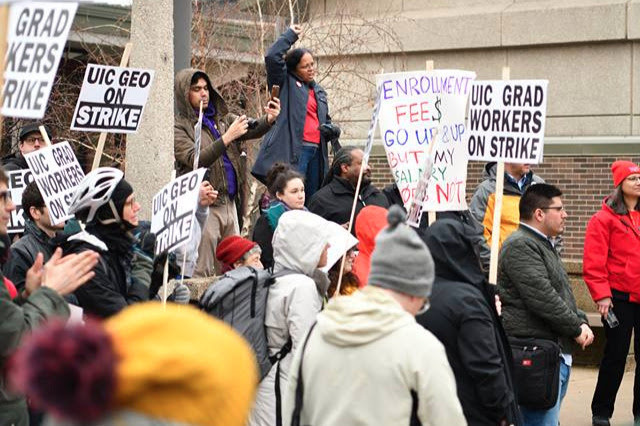 RAFO has donated to UIC GEO's strike fund. If you wish to donate individually, please click here to find their fundraising campaign. We've all been graduate students, so we know a part of their struggle. The following message is an update from their Fundraising Campaign. As we move into the second week of our strike, we want to thank you for the help you have given us. Seeing all of the donations and messages of support roll in from undergraduates, faculty, staff, family, alumni, fellow union members, and allies from all across the country, we have known that we are not alone in facing a university administration that does not value our labor. Besides keeping our picketers fed, our signs waving, and our megaphone batteries charged, your donations have also given striking grad workers more confidence that they are protected from HR’s threats to dock their pay. We were prepared for a long fight, and since the administration has certainly made no real move to change anything, we may be out for some time yet to come. For this reason, you will notice that we are raising the cap on donations to our strike fund, which, thanks to your help, has already almost reached our initial goal. If you know of any others who may be inclined to support our strike, please pass along the link. And thank you for your contribution to the fight to uphold the dignity of labor! RAFO President, Jen Wilson, is holding a Q & A session for the membership on March 26, 2019 at 7:00 p.m. CST. In this meeting, she will answer questions about the referendum items that will be voted on Tuesday, April 2 from 10 a.m. – 4:00 p.m. in the AUD 256 and Wednesday, April 3 from 1:00 – 6:00 p.m. in WB 1315. To attend the meeting, click this link https://roosevelt.zoom.us/j/133270604. RAFO asks its members to vote on three items at the Spring 2019 membership meeting. All full bargaining unit members have the right to vote in person by ballot. Voting will occur on Tuesday, April 2 from 10 a.m. – 4:00 p.m. in the AUD 256 and Wednesday, April 3 from 1:00 – 6:00 p.m. in WB 1315. During March, RAFO will hold a Q & A session by Zoom conference to address concerns and feedback from the membership (date and time TBD). Roosevelt University Adjunct Faculty Organization seeks to eliminate the position of Communication Chair from our Executive Officers as listed within the Bylaws - Article Two, Section A. Voting members who wish to serve on the Executive Committee must be no lower than Step Two members, per the RAFO CBA. Dues will be increased $25.00 from $125.00 per semester to $150.00 per semester. RAFO's First Professional Development Conference!